External gear pumps are a popular pumping principle and are often used as lubrication pumps in machine tools, in fluid power transfer units, and as oil pumps in engines. External gear pumps can come in single or double (two sets of gears) pump configurations with spur (shown), helical, and herringbone gears. Helical and herringbone gears typically offer a smoother flow than spur gears, although all gear types are relatively smooth. Large-capacity external gear pumps typically use helical or herringbone gears. Small external gear pumps usually operate at 1750 or 3450 rpm and larger models operate at speeds up to 640 rpm. 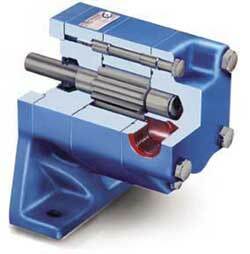 External gear pumps have close tolerances and shaft support on both sides of the gears. This allows them to run to pressures beyond 3,000 PSI / 200 BAR, making them well suited for use in hydraulics. With four bearings in the liquid and tight tolerances, they are not well suited to handling abrasive or extreme high temperature applications. Tighter internal clearances provide for a more reliable measure of liquid passing through a pump and for greater flow control. Because of this, external gear pumps are popular for precise transfer and metering applications involving polymers, fuels, and chemical additives. External gear pumps are similar in pumping action to internal gear pumps in that two gears come into and out of mesh to produce flow. However, the external gear pump uses two identical gears rotating against each other -- one gear is driven by a motor and it in turn drives the other gear. Each gear is supported by a shaft with bearings on both sides of the gear. 1. As the gears come out of mesh, they create expanding volume on the inlet side of the pump. Liquid flows into the cavity and is trapped by the gear teeth as they rotate. 2. Liquid travels around the interior of the casing in the pockets between the teeth and the casing -- it does not pass between the gears. 3. Finally, the meshing of the gears forces liquid through the outlet port under pressure. Because the gears are supported on both sides, external gear pumps are quiet-running and are routinely used for high-pressure applications such as hydraulic applications. With no overhung bearing loads, the rotor shaft can't deflect and cause premature wear. A composite external gear pump performs well in corrosive liquid applications. As the following list indicates, rotary pumps can be constructed in a wide variety of materials. By precisely matching the materials of construction with the liquid, superior life cycle performance will result. External gear pumps in particular can be engineered to handle even the most aggressive corrosive liquids. While external gear pumps are commonly found in cast iron, newer materials are allowing these pumps to handle liquids such as sulfuric acid, sodium hypochlorite, ferric chloride, sodium hydroxide, and hundreds of other corrosive liquids.